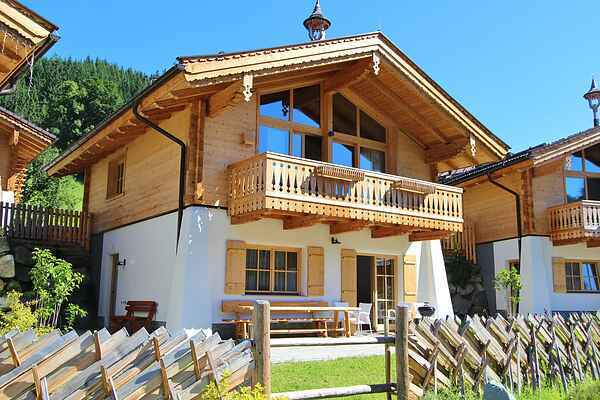 This extremely luxurious detached chalet is located in the village of Wald (part of Wald Königsleiten) on the state border between Salzburg and Tyrol. You have the chalet all to yourself, privacy guaranteed. The total accommodation is two levels and both the interiors and exteriors feature lots of woodwork, lending it an authentic Austrian feel. The interior design has great ambience, which will make you feel right at home. The bedrooms are mainly on the ground floor, so there is a beautiful living area on the first floor with a fabulous cathedral ceiling. The open-plan kitchen is equipped with all the modern appliances and you have a great view of the surrounding mountains from the south balcony. There is a private sauna for total relaxation. This chalet lacks for nothing. In the immediate vicinity you will find a lovely indoor swimming pool, various dining and shopping options and the ski bus that goes to the ski area. Thanks to the central location you can use both the Wildkogelarena ski area and the Zillertalarena. The ski bus stops about 500 metres from the chalet. Hohe Tauern National Park, with its famed Krimml Falls, is literally right next door in summer. Sure to be a hit!